Tony Makuch sees a bright future for gold mining in the Timmins-Kirkland Lake area. 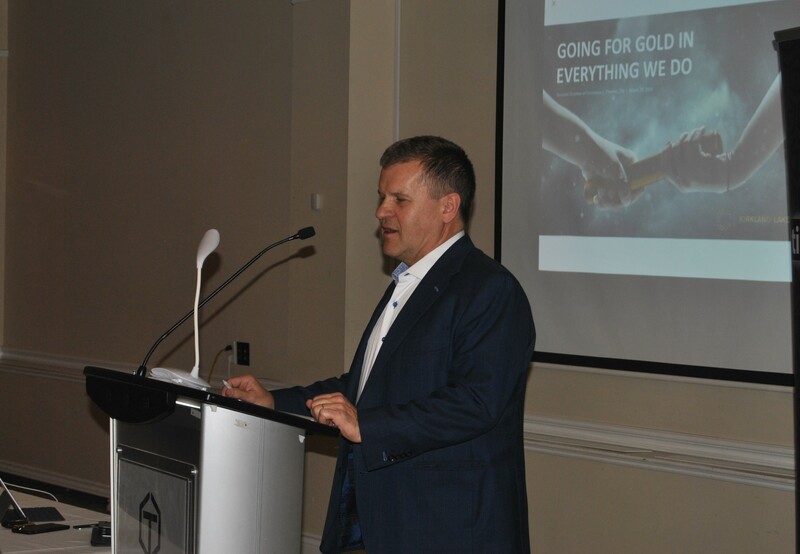 Timmins's born Makuch, Kirkland Lake Gold's President and CEO, shared his vision for of the company's future, before a luncheon crowd at the Dante Club, on March 20, as part of the Timmins Chamber of Commerce's speaker series. "The notion that Timmins' - Kirkland Lake area is mined out is wrong," Makuch said confidently. Makuch grew up in Timmins, and has worked as President and CEO of Lake Shore Gold and Canada President of Tahoe Resources, prior to becoming President and CEO of Kirkland Lake Gold in 2016. There is still more gold to find and mine in the prolific structure known as the Abitibi-Greenstone Belt he told the audience. Kirkland Lake will spend approximately $2.8 billion over the next 20 years in the area. Some of that will be payed out in royalties, but much will be investment that will benefit the region by creating jobs and opportunities for suppliers. Kirkland Lake Gold currently employs 2,000 people at its Kirkland Lake operations, and about 2,500 when you add suppliers and service providers. "I will say this, although there has been over 100 years of mining in this region, with between 200-220 million oz of gold mined in the Abitibi-Greenstone belt, there is still probably just as much sitting in the ground and it’s up to us to take that legacy on and move it forward," Makuch said. When Henry Dobson purchased Macassa in 2002 for $5 million many people thought they paid too much. "You think of Macassa Mine in Kirkland Lake, today - it has historically produced 5 million ounces of gold over the last 70 years," Makuch explained. "Yet Macassa produced 240,000 oz. alone in 2018 for Kirkland Lake Gold," he added. "Who would have thought that Macassa could produce that amount last year?" When Kirkland Lake Gold purchased Newmarket Gold and Fosterville Mine in Australia in 2016 Makuch recounted, many people said you can't produce more gold from that mine, but now, look at the turn around that has occurred at Fosterville. The first mine in Fosterville, Australia was in 1885. Until the First World War, they mined over 20 million oz. "Everyone said these mines are mined-out," he said. In 2016 when KLG acquired Newmarket's Fosterville Gold mine the mine produced 35,000 oz. at 7 grams/per tonne. "Since then we are mining three-quarters of million ozs. at 20 grams/per tonne grade," Makuch explained. "We are sitting there with 2.7 million oz. in reserve with a grade of 31 grams/per tonne." In 2018 Fosterville produced 356,000 oz. Together with the 240,000 oz. from Macassa and contributions from the Holt /Holloway, Taylor and other properties in Canada (on care and maintenance), as well as the Northern Territory properties in Australia (on care and maintenance), the total gold produced in 2018 for KLG was 723,000 oz. Goal of 1 Million Oz. In 2016 when KLG put together the three companies 520,000 oz. were produced. despite closing down production at the Holloway Mine and a mine in Australia that totalled 120,000 oz. Kirkland Lake Gold still was able to produce 723,000 oz. The goal for KLG is to produce 1 million oz. of gold per year. KLG is planning to re-open the Holloway mine that it acquired from St. Andrew's Goldfield in 2016. Makuch said the restart at Holloway will begin at 30,000 oz. per year, but hopes to increase output to 100,000 to 150,000 oz. per year. The keys to Kirkland Lake Gold's success are innovation, diamond drilling exploration, discovery of higher grade ores and increasing productivity. "And that's what we are doing at Kirkland Lake Gold," Makuch said. People today ask Makuch about the recent mergers and acquisitions that are taking place between Newmont and Goldcorp, Pan America Silver and Tahoe Resources and between Barrick and Randgold. They raise concerns that these companies will decide on what is core and non-core assets. They look at operations like the old Lake Shore Gold and they'll say, that's non-core. Makuch points out that the merger of KLG and Newmarket Gold built synergies instead of mine closures. Makuch refered to two examples of mines operated by KLG Fosterville and Macassa. Kirkland Lake Gold has been a very successful company over the last couple of years, said Makuch. A big part of Kirkland Lake Gold's success during the last two years was as a result of the company's acquisition of St. Andrew's Goldfields, near Matheson, Ontario and Australia's Newmarket Gold in 2016.
" At the time people were wondering why we were doing that," Makuch said. " Are you trying to be bigger for bigger’s sake? Makuch tried to explain to the shareholders that there are lots of synergy in building a bigger company. Like being able to manage capital market risks better. The success of Kirkland Lake Gold can be seen in the rise of its share value from $2.20 in 2013 to $43 per share as of March 20, 2019. In 2016, when Makuch joined Kirkland Lake Gold as President and CEO from Tahoe Resources, the company's share price had risen from about $15 per share to $43 per share. "When the share price rose from $15 to $16 people said they missed the story and now that the share price is $43 people feel that it reached the top, but there is room for further growth," Makuch said. Makuch said Kirkland Lake Gold is building a special company with a good team, with good people working as geologists, and applying good technology, each member brings important skills to the table. An important member of the Kirkland Lake Gold team is Eric Sprott, noted gold expert and investor, who became a major investor in the company and it's chair in 2015. Sprott recently announced he would be stepping down as Chairman of the Board, but still would remain an active shareholder. In terms of Kirkland Lake Gold what drives value is high grade gold. The higher the grade of the ore, less production costs. Makuch explained that metalurgy has also improved. Where once 80 to 82 % recovery rate was the norm, KLG is now able to get 90-95 % recovery. The best away to attract investment is by having a profitable company. The good thing about gold is that it never becomes irrelevant. A company like Apple has to keep re-inventing its products every couple of months or it becomes irrelevant. nd mine it as cheap as possible," Makuch said. KLC earning in 2018 was $1.30 per share on net earnings of US $273.9 M, compared to $0.64 per share on net earnings of US $132.4 in 2017 for a 107 % increase. The company has experienced a 30 % growth in production from 2018 to 2019. KLG is one of the lowest cost, pure gold producers and they are doing that from old assets that everyone thought were dead. Now, that's a success story. In 2018 KLG had cash costs of $362 - a 25% reduction from $480 in 2017. The All In Sustaining Cost (AISC) for 2018 was $685 compared to $810 in 2017 a 16 % reduction. The other important aspect of KLG's operation is that they make sure to re-invest wisely with sustaining Capital Expenditures, such as buying new equipment and under taking exploratory drilling. In terms of cash, KLG has amassed $400 million US. They are a company with a strong balance sheet and they have no debt. At Kirkland Lake's Macassa Mine, the construction of Shaft #4 KLG will lead to annual producton of 400,000 oz per year. The shaft will will reach 7,000 feet in depth and it will allow for 4,000 tonnes of ore per day to reach the mill. Once the Shaft #4 has been built to 7,000 ft level by 2023, the new shaft will make it easier to transport the ore to the Macassa Mill and it will double the ventilation resulting in improved working conditions. An other area of innovation for Kirkland Lake Gold is the introduction of Battery Electric Vehicles (BEV) at Macassa. According to Makuch, BEVs are more efficient than diesel engines and that is the main reason KLG has decided to use them at Macassa. "It operates more hours, the power you get is greater than with diesel engines, we have to torque it down. It's the way to go. It's also quieter and produces less heat," explained Makuch. "We are investing in BEVs and we have two prototypes working at Macassa," Makuch said. "We are all in in terms of switching to BEVs." "If I could add BEV vehicles to Fosterville Mine, I could increase production by about 20 to 30 percent," Makuch added. Makuch said KLG recognizes BEVS are the mining vehicles of the future and are ready to invest. A BEV production facility operating out of Ontario's northeast is one possiblity. He holds a Bachelor of Science Degree (Honours Applied Earth Sciences) from the University of Waterloo in Ontario, and both a Masters of Science Degree in Engineering and a Masters of Business Administration from Queen´s University in Ontario. He is a professional engineer (Ontario) with over 35 years of management, operations and technical experience in the mining industry, having managed numerous projects in Canada and the United States from advanced exploration through to production. Prior to joining Kirkland Lake Gold, Mr. Makuch was President and CEO at Lake Shore Gold Inc., from 2008 until its acquisition by Tahoe Resources on April 1, 2016, where he became the Executive Vice-President and President of Canadian Operations. Between January 2006 and March 1, 2008, Mr. Makuch was Senior Vice President and Chief Operating Officer for FNX Mining Company Inc. From 1998 to December 2005 he held progressively senior positions with Dynatec Corporation, including VP, Operations. From 1992 to 1998, Mr. Makuch worked with Kinross Gold Corporation at a number of their North American operations; which included his role as General Manager of the Kirkland Lake Operations at the Macassa Mine and Timmins Operations – Hoyle Pond Mine.